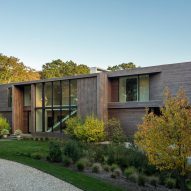 American studio Blaze Makoid Architecture has created a spacious, cedar-clad dwelling in the Hamptons that was envisioned as "a secret enclave in the trees". The Old Sag Harbor Road home is located in Southampton, a village on New York's Long Island, and was designed for a couple. One client travels frequently and wanted a place to recharge. 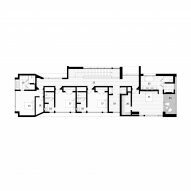 The other is an interior designer who recently earned an architecture degree and served as a key collaborator on the project. 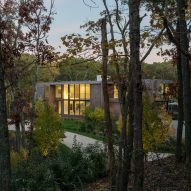 "The clients are an energetic couple who were attracted to the pristine surroundings, and envisioned the project as a secret enclave in the trees for themselves and their friends," said local studio Blaze Makoid Architecture, or BMA, in a project description. 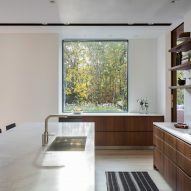 Encompassing 7,100 square feet (660 square metres), the multi-storey dwelling sits on a high point within a heavily wooded property. The home was positioned so that it runs parallel to the natural contours of the landscape. 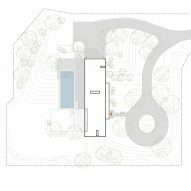 Rectangular in plan, the residence is composed of long bars that stretch across the site. 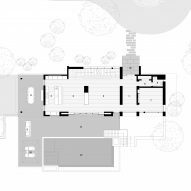 The upper mass slightly cantilevers over the lower portion of the home, resulting in a T-shaped form. "The house is long and narrow, with the programme arranged linearly for an economically minimal footprint," the team said. 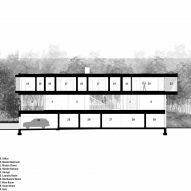 "The horizontality of the design allows the second-floor mass to float above the landscape and cantilever at both ends." Exteriors wall are wrapped in cedar and large stretches of glass. 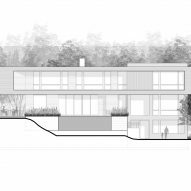 Providing views of the wooded terrain was a key concern for the architects. "Known for its seamless approach to indoor/outdoor living, BMA designed moments for the clients, in which they could look out to the trees instead of walls," said the team. The interior of the home features light-filled rooms with contemporary decor. Walnut was used a recurring feature to help create a sense of warmth and intimacy. A wooden staircase with a black railing serves as a sculptural element that weaves all three floors together. The ground level contains the public zone. Situated between the living room and dining area is a wide hearth clad in blackened steel. A 20-foot-wide (six-metre) glass wall slides open, enabling this area to spill outdoors – a feature that is perfectly suited to the homeowners' love for entertaining. 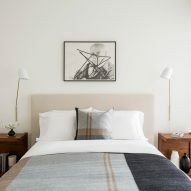 Upstairs, the team placed three bedrooms, including a spacious master suite with a terrace. The basement level of the home contains a game room and wine cellar. "The clients own an extensive wine collection, so the climate-controlled wine room, with its blackened steel supports and custom walnut shelving, was a must-have and is used as a backdrop to a custom banquette in the game room," the team said. The sloped topography enabled the team to incorporate "a walk-out lower level, which is unusual for the area". The backyard features a lush lawn and a negative-edge pool that captures reflections of the natural surroundings. "Surrounded by pristine woods and clad in cedar, this is a project that celebrates the forest and all its delights," the studio said. Blaze Makoid, who studied as the Rhode Island School of Design, founded his eponymous firm in 2001. 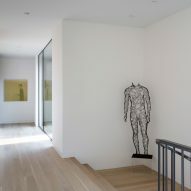 Another project by the Bridgehampton-based studio is a holiday home that steps down a forested hillside in California. Photography is by Attic Fire.